Intent: Point of reference for the species on Sraeljoarsk and as a baseline for other submissions and as a potential plot device. Distinctions: The Draeyde are small, carnivorous creatures. They have slimy frail skin and no eyes, they are blind and are entirely blind. They have frigid movements, and are incredibly fast and dangerous. However, they are also very photosensitive. ​- Pack Animals: The Draeyde, due to their short lifespan, always travel in packs of newly birthed Draeyde. Usually consisting of at least three hundred of them at once. Each pack hunts alone, and works in unison to rip apart its prey's flesh. - Incredibly Dangerous: The Draeyde are incredibly fast. They tear apart un-armoured or shielded humanoids in seconds, however have trouble with metal and rock. - Fear Inducing: The Draeyde tend to slit their packs into groups of fifteen, not too far apart from each other. When they sight their prey, they typically retreat and wail violently for the rest of the pack. In moments, they set upon their prey. - Hard Target: Due to their speed and size, Draeyde are typically very difficult to hit with single fire or conventional weaponry. However when in flight, they travel as a sort of tendril through the air with the rest of their pack. Which, often allows a shooter to kill a few and deter the rest. ​- Fickle Flesh: The Draeyde have incredibly frail skin. A single blaster round could cause one to explode. - Extreme Photosensitivity: The Draeyde have an extreme sensitivity to light, being caught in direct sunlight or a powerful enough beam of light can cause them to immediately burst into flame and quickly die. Additionally, blasters and lightsabers both are plasma based weapons that create an area of light from their shooters position. Both of these weapons can be used as reliable deterrents. - Wall of Light: These creatures will die immediately if faced against a wall of light. - Terror of Flame: The Draeyde are also extremely susceptible to sources of heat, a few hundred of them could easily be killed with a single flame thrower. - Light alignment: The Draeyde have a strange abhorrence to those of a light alignment, and would avoid eating them unless feeling threatened. This is a double edged sword, they prefer darker aligned flesh. General behavior: These creatures are predators through and through. They are hunters of the night, and masters of shadows. Typically, they are pack creatures and never hunt alone. As, one Draeyde alone, whilst a nuisance is not a formidable foe. 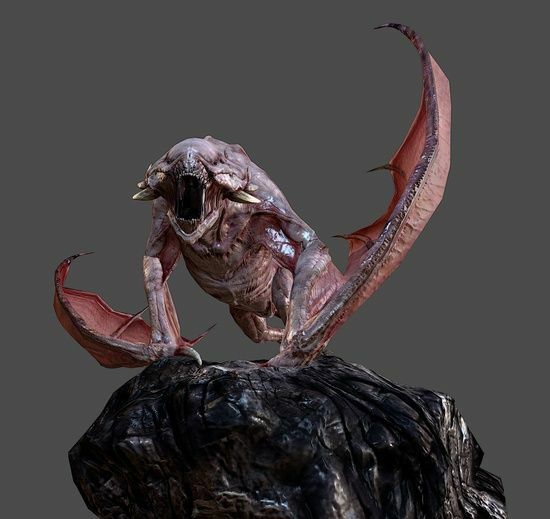 ​​These creatures were discovered by researches studying the planet on the behalf of the Bryn'adûl and are largely why the planet is considered uninhabitable. It is theorised that they evolved from larger and more independent animals, it's likely that the pollution of the air by the Vo'uldesh drove these larger creatures under ground and slowly they evolved into smaller more carnivorous and vicious creatures as they had to travel great distances underground to find food. It was only many years later that the Draeyde, due to their slow exposure to the ink became immune to its effects and were able to form a symbiotic bond with the Vo'uldesh. The Draeyde have been the dominant species on Sraeljoarsk for hundreds of years, and are considered the most dangerous. Edited by Tathra Khaeus, 24 September 2018 - 05:46 PM. Okay, everything looks in order here. I'm gonna go ahead and pass this one up. Pending Trainee Approval.